Here’s an explainer you can share with clients to calm them down. Headlines right now are scary, and we wouldn’t blame you if you turned your stock market terminals off to take a few deep breaths. Here’s an explainer you can share with clients to calm them down. The stock market is cyclical. It builds up, peaks, then falls – and then the process starts over again. 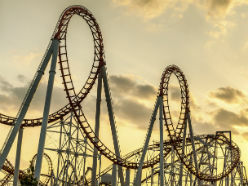 Right now, we’re in the falling part of the cycle, and all three major equity markets (the NASDAQ, S&P500 and Dow Jones) are in what’s called a correction, defined as a 10% drop from a recent peak. Stock market corrections have historically happened every 18 months. The last time we had a correction was August 2015, but that was the first in nearly four years, an unusually long gap. Corrections happen because investors have been too optimistic about a certain stock or group of stocks, and they keep buying, pushing prices up. As that happens, an investment’s price becomes disproportionately high compared to its actual worth. Some people realize this, and get out before their fellow investors. When other investors see that, they become highly sensitive and if they hear the slightest bad news, they’ll leave the market, too. That causes prices to fall, or correct. Why is a correction happening again? Chinese stock markets have been extremely volatile in recent months, rising to record highs and then plummeting on worries about policy changes, slowing economic growth and a weaker yuan. While North American investors aren’t exposed to those stock markets directly, China is a global powerhouse, so weakness there concerns investors everywhere. Those concerns have had an outsized effect on prices of oil and other commodities because China is such a big consumer. Couple that with too much oil on the markets, which means oil at its lowest price in 12 years, and you’ve got a recipe for investor panic. Here are 4 things that help make sense of the current market turmoil. 1. Our top dogs are cautiously optimistic. Our country’s top economist, Bank of Canada governor Stephen Poloz, has said he anticipated this mess. Why does that matter? The Bank of Canada is responsible for two things: monitoring Canada’s economic climate and setting the country’s interest rates, which it does eight times per year (including today). These decisions impact the value of the loonie and the country’s debt levels since they affect how much it costs to borrow money. Today, the bank said it expected rough markets in Canada and low oil prices, but its analysis shows that global growth will improve this year. And, provided you don’t work in the oil or resource sectors, you will likely keep your job, says Poloz. As a result, you and your fellow Canadians will continue to spend money, buoying our economy. Plus, you may remember Prime Minister Justin Trudeau promised to kickstart our economy by building and improving public infrastructure, such as roads and bridges. Poloz predicts that action will help boost Canada’s markets. PM Trudeau wants Canada to leave its resource-dependent economy behind. “My predecessor wanted you to know Canada for its resources. I want you to know Canadians for our resourcefulness,” he told world leaders at the World Economic Forum in Davos, Switzerland, today. But pivoting will be difficult. A fifth of our economy is reliant on oil and other natural resources. They directly contributed 15% of Canada’s GDP, and 900,000 jobs in 2014, says Statistics Canada. The sector added another 5% to GDP and 900,000 jobs through indirect impact, as workers use their wages to buy homes, cars, go out for dinner, and send money home to unemployed relatives in other provinces. Bank of Canada governor Poloz says the drop in oil prices over the past year or so has taken $50 billion out of the country’s national income, or $1,500 per person. And it’s not just low oil prices punishing the economy. Prices for other commodities are at rock-bottom, too. Canada is the world’s top potash producer, and Potash Corp. has had to lay off hundreds of well-paid workers because it can’t afford to keep its all facilities open during low prices. That’s why Trudeau and other political leaders want our economy to diversify. The training programs, business incentives and other work needed to get that done, however, will take years. There are signs that America — Canada’s largest trading partner — is faltering. The U.S. economy has been expanding for 79 months, when the average is 58.4. Some economic observers say the U.S. stock market is behaving similarly to how it did at the beginning of the financial crisis. Also troubling are signs that America’s manufacturing output has been falling. And last fall, experts said they didn’t think America’s economy would grow as much as expected in the final months of the year. In fact, at least one analyst thinks the country is already in a recession. In Europe, things aren’t looking great either. The rate of inflation (the cost of buying goods and services) is much lower than policymakers want – coming in at 0.2% in December 2015, instead of a healthy 2%. That points to less consumer demand in another of Canada’s largest trading partners. 4. Fortunately, all this bad news means opportunity. As mentioned earlier, we’re in the falling part of the stock market cycle. It’s scary to see prices dropping, but don’t panic – if you don’t need your invested money now, there’s no reason to pull it out. That’s because you’d be selling at a time when your investments are low. Worse, once you feel comfortable enough to get back in, things will likely have recovered, and you’ll be buying high. Instead, think of current market turmoil as an opportunity. If you’re not retiring for another 25 years, that means you have 25 years to make up today’s losses, ride out more bumps and earn returns. That also means that you’ll have a chance to buy good, stable companies while their prices are low compared to their true values. Many investors find that automating their investments (e.g., having them deducted on bi-weekly paycheques) can take the emotion out of the decision. Want to learn even more about what’s happening on the market? Read Why the stock market is tanking right now, and what comes next, by Advisor’s sister magazine, Canadian Business. How does the Bank of Canada make interest rate decisions? To gauge the economy’s health, the Bank considers indicators such as employment data, GDP growth and how key commodities are faring. And, over the last 12 months, the Bank’s biggest concerns have been dipping oil prices and slow global growth. As a result, it’s cut interest rates twice, which has led to our current overnight rate of 0.5%, which is at a historic low.